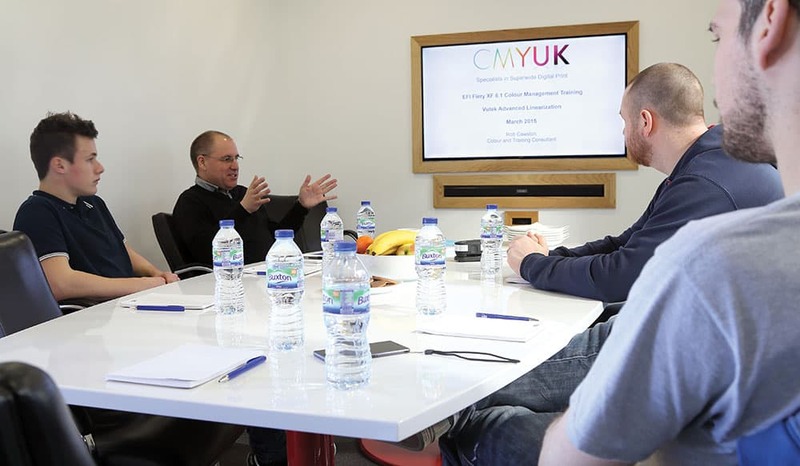 Buying a printer from CMYUK is only the first part of your wide-format journey to success. Our philosophy is built on relationships with our customer base so that you know, from day one, you’ll be looked after with our training, technical support and maintenance teams. We don’t merely tell you what you should do once your equipment has been delivered and installed. Instead, we work with each company according to its individual needs because we know no two businesses are the same. From the moment you order your new equipment from us, our support remains with you right through to the day you come back to us for your next printer or cutter. Businesses are about the people who use the technologies and not just the machines they employ, and we understand the value of individual levels of training and support. From start-up wideformat assistance, through software implementation and colour profiling, to advanced colour management by our FOGRA certified engineers, we cover every aspect of understanding needed. On-site training is always carried out and followed through by skilled technicians at our Shrewsbury facility and, of course, full support is available if needed, so that our expertise makes sure your skills are maintained at the highest levels.